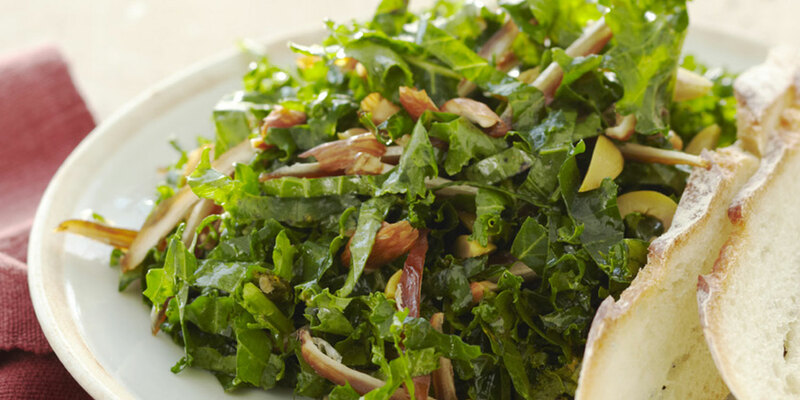 In large bowl, toss kale with lemon juice, oil, salt, and pepper; set aside. In 12-inch skillet, combine pearl onions, margarine, 1 tablespoon water, Worcestershire sauce, and sugar. Cook over medium 8 to 10 minutes, until onions are tender and almost all liquid has evaporated, stirring occasionally. Add vinegar to skillet. Increase heat to medium-high. Cook 3 to 4 minute, until onions are browned, stirring frequently. Add remaining 1 tablespoon water. Cook 1 minute longer, swirling pan constantly. (Onions can be refrigerated, covered, up to overnight.) Transfer onions to bowl with kale. To kale, add cherries and pine nuts; toss vigorously to combine. Add Cheddar; toss. Transfer to serving platter.